The bar’s sign reads like a mash-up of Chinese propaganda and nationalism’s greatest hits. “Japanese militarists” harken back to Japan’s colonial era, from the late 1880s to the end of WWII. The Yasukuni Shrine in Tokyo is dedicated to all those who have given their lives to the Emperor, including WWII dead. Because of the brutality of colonial Japan and the lack of a satisfactory apology, annual visits to the shrine by Japanese heads of state send China and other East and Southeast Asian countries into a fury. Rebiya and Kadeer and the Dalai Lama. Chen Shui-bian, the first non-KMT president of Taiwan, is one of the founders of Taiwan’s pro-independence Democratic Progressive Party. He’s less involved these days, as he is serving a 19-year prison sentence for graft, money laundering and forgery. The curious group of unwelcomes at the end of the list is a conflation of the Tibetan and Uighur human rights movements. 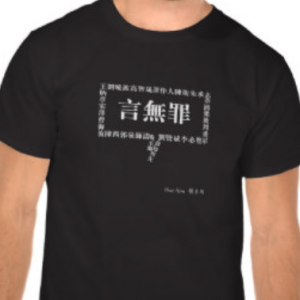 “East Turkestan” refers to the Xinjiang Uighur Autonomous Region, site of protests in 2009. 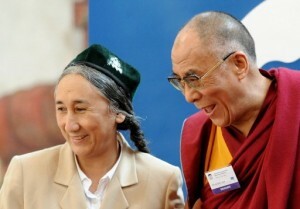 Rebiya Kadeer, exiled president of the World Uyghur Congress, has been labelled the “Uyghur Dalai Lama” and blamed for the 2009 violence in the Chinese press. Neither the Dalai Lama nor Rebiya Kadeer publicly advocate secession from China. GuoShaoying: Is this an anti-traitor bar? PepperXiang-RealEmperor: Followers of the Dalai Lama’s East Turkestan separatist movement—the guy who wrote this must think he’s really smart, but he managed to make a fool of himself in one sentence. Why don’t educated people open bars? ZhouXu: The Dalai Lama merged with the East Turkestan separatists? Now he’s involved in Xinjiang, too? XiangXiaokai: How can the East Turkestan separatists stand to be so insulted as to have the Dalai Lama called their leader? 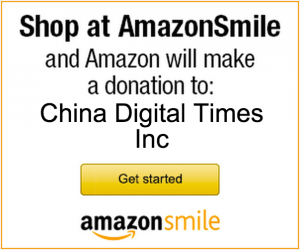 Read more about Taiwan, Tibet and Xinjiang from CDT. Sign translated by Josh Rudolph.